1 After this I looked, and there in heaven a door stood open! And the first voice, which I had heard speaking to me like a trumpet, said, “Come up here, and I will show you what must take place after this.” 2 At once I was in the spirit, and there in heaven stood a throne, with one seated on the throne! 3 And the one seated there looks like jasper and carnelian, and around the throne is a rainbow that looks like an emerald. 4 Around the throne are twenty-four thrones, and seated on the thrones are twenty-four elders, dressed in white robes, with golden crowns on their heads. 5 Coming from the throne are flashes of lightning, and rumblings and peals of thunder, and in front of the throne burn seven flaming torches, which are the seven spirits of God; 6 and in front of the throne there is something like a sea of glass, like crystal. At the end of Revelation 3 the congregation in Laodicea was instructed to open the door when they hear the voice of the Lord and, with the other seven churches, to hear what the Spirit is saying to the churches. At the beginning of chapter four there is now a door that is open, the voice of the Lord (described in Revelation 1: 10-11 as a voice like a trumpet) now invites John to come up and see. Now once again John is in the spirit to see what is to be revealed to the churches and to the world. The promise at the end of the previous chapter promises to the one who conquers a place on Christ’s throne, and the throne Christ shares with God, now John (and by extension the readers) are invited to see the throne room of God to share in the things that are about to be revealed. Some modern futurist interpretations of Revelation note that the word church disappears here until the end of the book and use this along with Paul’s address to the congregation in Thessalonica when he mentions the saints meeting the Lord in the air (1 Thessalonians 4: 16-17) to argue that the faithful church will be raptured away from the troubles that come in the later portions of the vision. While this view has a lot of popular support it also misreads Revelation and the New Testament in significant ways. The passage in 1 Thessalonians is Paul’s reassurance to the church in Thessalonica who have seen some of their members die that at Christ’s return to earth both the dead and the living will greet the returning Christ and join in procession with him as he returns. The direction of both Paul and Revelation’s theology is the return of God to dwell on earth, a reality where ‘on earth as it is in heaven’ becomes a reality. Instead of following Jesus’ call to his disciples to take up their cross and follow him in my view this interpretation makes the congregation of the faithful a group that when the going gets tough they are gone. It also requires the address to John to come, a singular invitation, to be broadened to the entire church in a futuristic way. Before delving into the imagery of the throne room of God in all its strangeness to a modern listener it is helpful to realize that ancient listeners found scenes like this both fascinating and dangerous. Throughout religious history there have always been those who approached faith in a more mystical manner. In the early church the idea of the spirit taking someone up into a vision of heaven was accepted and within Judaism of this time we have writings which would testify to the writer entering the throne room of God. Jewish mysticism at this time rotated around two critical passages: Genesis 1 (the creation) and Ezekiel 1 (the throne room of God). This Jewish mysticism around Ezekiel 1 was known as merkbah and tended to be theologically interested in both God’s nature as well as the hierarchy and explaining the surroundings of the vision of God’s throne in heaven. Christopher Rowland points out that within the Mishnah (early Jewish writings explaining Torah probably compiled in the first and second century) we see evidence that, “Reading Ezekiel 1 was severely restricted by ancient Jewish teachers because of its use by visionaries and the dangers to faith and life that such visionary activity posed.” (NIB XII: 596) Yet, Ezekiel and Revelation continue to fascinate and perplex people and the time when the church or synagogue could prevent people from reading these passages has long passed. Diving into this passage we are invited to imagine the scene that John sees and records. As implied above the passage echoes the portrayal of the throne room in Ezekiel 1 in several ways, but there are also several differences. We are invited to view what must take place in several powerful symbolic visions which will proceed in several cycles. Within each of these cycles there are pauses and delays to give time and space for repentance and change. But the early Christian communities who were struggling to remain faithful in the world of the Roman empire found this vision comforting because it reminds them that God has both the power and the authority to act. The forces of death and destruction, which will often be described in language that parodies the language of the Roman empire, will come to an end in this vision. The church may still be in the time where the saints cry out, “how long, O Lord?” and yet, Revelation allows the churches to know that God will not remain inactive. While the Psalms, Isaiah, and the prophet Micaiah in 1 Kings could all mention the throne of God briefly (Psalms 11: 4, 103:19; Isaiah 6: 1-3; and 1 Kings 22:19) it is only Ezekiel 1 and Daniel 7: 9-10 that risk any type of description of God or God’s throne. The language of simile is used to describe that which is beyond description. The figure on the throne is like jasper and carnelian, two precious stones that have blue/purple and reddish colors respectively. The rainbow around the throne is emerald like in its splendor. Even Revelation doesn’t dare to dwell too long upon the figure sitting upon the throne but instead focuses its attention on the area surrounding the throne. The twenty-four elders have been related to the twelve tribes and twelve apostles, priests and musicians in the temple, attendants of the Roman emperor, the cosmic order or even the twenty-four hours of the day. Each of these images is suggestive and may enrich how we view these figures but the term presbyteros (translated elder, this is where the Presbyterian church takes its name) is frequently used in the New Testament for elders within the church. 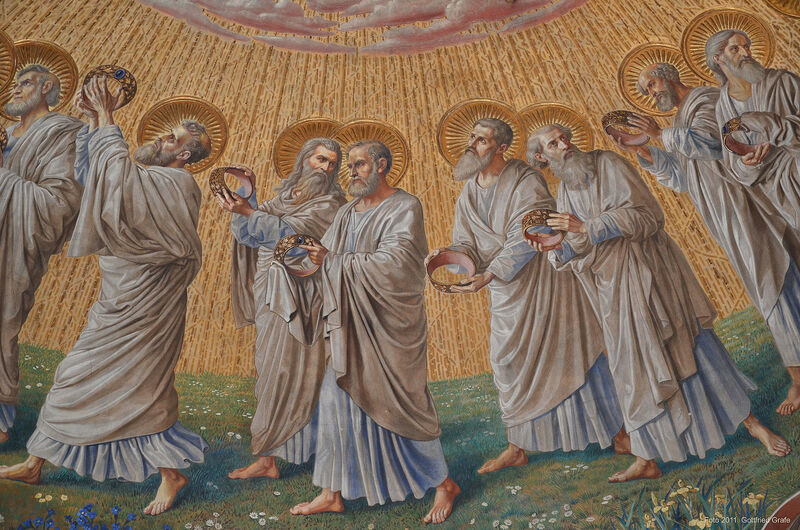 These elders of the church may be taking on a timeless cosmic role as they minister around the throne of God, but they like the seven spirits of the churches in Revelation 1, they probably connect the church on earth with what is going on in heaven. The four living creatures bear some similarity to the creatures mentioned in Ezekiel 1, but also a significant difference. Instead of each creature being the same with human form but four heads (human being, lion, ox, and eagle) the creatures now are individually like a human, lion, ox and eagle. This image of the four creatures has had a rich history in interpretation from representing the four gospels, to Joachim of Fiore’s four senses of Scripture (literal, moral, spiritual and anagogical) to representing constellations. I like the suggestion that they are heavenly representatives of the created order (Koester, 2014, p. 353) since so much of this portion of Revelation is permeated with creation imagery and praise of God as the creator. 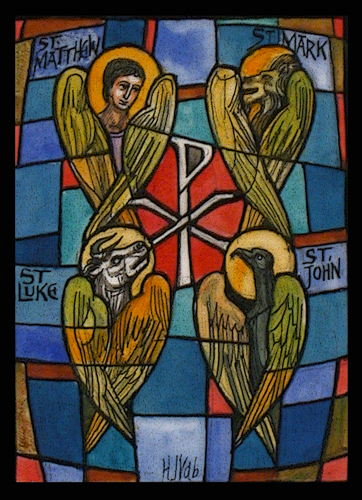 Yet, I love the iconography which identifies the four gospels with the images from the creatures (even if there were disagreements in the early church about which gospel was represented by which image the identification of Matthew (man/angel), Mark (lion), Luke (ox), and John (eagle) has become standard in iconography). It is appropriate that this scene where there is continual singing has become an inspiration for the church’s singing and worship life. As I read these songs where the creatures sing “Holy, holy, holy, the Lord God the Almighty, who was and is and is to come” I have the words and melody of the hymn by Reginald Heber and John B. Dykes “Holy, Holy, Holy, Lord God Almighty” and as the elders cast their thrones at the feet of the one who lives forever and ever the lines of Handel’s Messiah singing, “and he shall live forever and ever, Hallelujah!” echoes in my mind. While the songs and worship in my church or any church is probably an inadequate reflection of this vision of the heavenly worship it does point to the centrality of the worship of God for these representatives of the people of God and the whole creation. The central proclamation of this heavenly worship is that God is the creator of all things and the one who causes creation to exist. The God of the Bible is not a creator who creates and then abandons the world, but who continues to sustain and watch over the world and God’s people. Revelation shows us a vision of blasphemous forces, represented by the dragon and the beasts, which seek to destroy the creation and usurp for themselves the worship due only to God and the lamb. The elders and the living creatures will praise God, while others will bow down before the beast. Many people in Revelation will be caught up in a lie and yet there is a time for repentance. There are those people and groups that may be unwilling to reconcile with God and yet we are shown that true worship is centered on God the creator and the lamb who has conquered who will become the central figure of the next chapter. This entry was posted in Biblical Reflections, Revelation and tagged 24 Elders, 4 Living Creatures, book of Revelation, Elders, gospel iconography, Mysticism, Revelation, Revelation 4, Throne room of God. Bookmark the permalink.